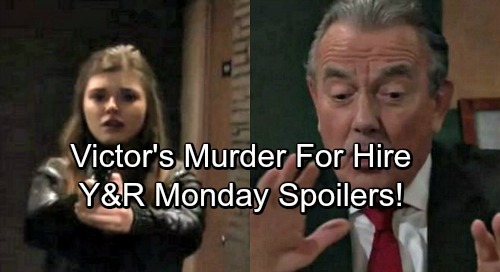 The Young and the Restless (Y&R) spoilers for Monday, November 27, tease that Victor (Eric Braeden) will be on a mission. Thanks to Zack’s (Ryan Ashton) involvement with Abby (Melissa Ordway) and Newman Enterprises, Victor’s in a real bind. To make matters worse, there’s gossip about Victor hiring Crystal (Morgan Obenreder) to eliminate his problem. Victor will take steps to clear all this up in Monday’s new Y&R episode. Neil (Kristoff St. John) might pitch a few ideas so Victor can tackle this head-on. The Young and the Restless spoilers say Victor will display fierce determination. He’ll vow to restore Newman to its former glory and protect his status in business world. While Victor focuses on Newman’s future, Jack (Peter Bergman) will mull over his personal life. Now that he knows Dina (Marla Adams) has Alzheimer’s, Jack intends to make her the priority. He’ll be taking a leave of absence from Jabot so he can care for his mom. It looks like Jack won’t have much time for Nikki (Melody Thomas Scott) anymore. Dina’s all that matters to him right now. Will Jack decide to end this romance? He knows his relationship with Nikki drives Dina crazy. She’s less likely to have setbacks if she’s calm and content. The Young and the Restless spoilers say Jack will consider his options and make a decision. There’s a good chance Nikki’s getting dumped! Elsewhere, Nick (Joshua Morrow) will try to solve a mystery. He’s the top suspect in the fire investigation, but he’ll believe someone else might’ve torched The Underground. Nick will concentrate on finding new clues. He’ll hope to locate some proof that could clear his name and lock up the culprit. Y&R fans know Dina accidentally started the blaze, so this could lead to some tense moments. If Nick eventually learns the truth, he may think Dina was targeting his family. After all, Dina badmouthed the Newmans before stabbing Nikki. Jack could explain, but the revelation might make him reconsider taking care of Dina himself. She may need more monitoring than Jack can do on his own. Of course, it’s also possible Nick will make a big mistake. What happens if he blames the wrong person for this fire? That could certainly stir up some trouble, too! It sounds like Victor, Nick and Jack will all be pretty busy in the coming weeks. We’ll give you updates as other Y&R news comes in. Stick with the CBS soap and don’t forget to check CDL often for the latest Young and the Restless spoilers, updates and news.